Theater, visual arts and instrumental jazz are on the summer camp agenda at NIU this summer. At Summer in the Arts at Northern residential camps for junior high and high school students, campers work and live with NIU faculty, alumni, and students, gain a greater appreciation for the life of an artist, and experience their art as never before. NIU Jazz Camp and Theatre Arts Camp Junior are scheduled for July 10 to 15. 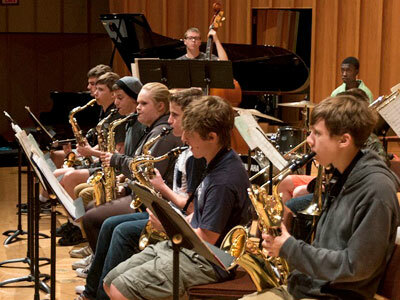 NIU Jazz Camp attracts instrumentalists in grades 8 to 12 who want to take their jazz playing to the next level. Campers rehearse and perform in a big band, combo or Latin jazz combo, preparing for the final day concert. Master classes, concerts, jazz theory, improvisation, jam sessions, sectionals and optional private lessons are all part of the daily curriculum. The camp is under the direction of Geof Bradfield, noted saxophonist and jazz studies faculty member at NIU. Theatre Arts Camp Junior is designed for theatre buffs who have completed grades 6 to 9. Campers enjoy daily classes, individual coaching sessions, theater games and rehearsals for the final day performance. Workshop choices include auditioning, acting, musical theatre, stage combat, make-up and more. Camp director Nathan Wyman is a professor of theater at William Jewell College near Kansas City. Visual Arts Camp and Theatre Arts Camp Senior are scheduled for July 17 to 22. Visual Arts Camp, for artists in grades 8 to 12, is an exciting and diverse creative art experience. 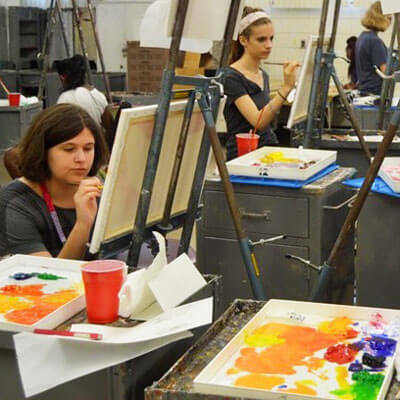 Campers enjoy two daily in-depth studio sessions, choosing from of a wide variety two-dimensional and three-dimensional classes. Camp activities also include talks by professional artists, open studio time and a gala art show on the final day. This camp is directed by Lynn Stockton, NIU alumna and award-winning art teacher at Jefferson High School in Rockford. Theatre Arts Camp Senior is an intensive program for students who have completed grades 10 to 12. Senior campers spend the week in rehearsals, classes and individual coaching sessions, honing skills and preparing for the final day performance. Workshop choices include auditioning, acting, musical theater, stage combat, make-up, and lighting and set design. Wyman is the camp director. Campers sleep and eat in newly renovated Gilbert Hall, located near the NIU Music and Visual Arts buildings. A variety of evening recreational activities include bowling, basketball, movies and talent shows and more. Early registrations, postmarked or received before June 2 receive a $60 camp fee discount. Returning campers save an additional $25. Need-based scholarship applications are being accepted through May 1. These popular camps fill quickly, so early registration is advised. For more information, call (815) 753-1450.